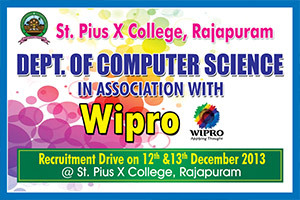 With a special mission to uplift the common man, the department of Computer Science started St.Pius Academy of Computer Education(SPACE) with the objective of better utilization of resources by the society. SPACE started in the year 1996.SPACE was a sub centre of Centre for Continuing Education, Govt.of Kerala and conducted training for C-DAC, Govt.of India. So far more than 500 students passed out from various diploma courses conducted by SPACE. Inauguration ceremony of SPACE was conducted on 14th August 2013, Wednesday. In this inauguration meeting all members of SPACE were present and in this meeting we prepared action plan for the activities of SPACE (2013-14). According to the action plan, our first interesting programme was a Space Quiz. For this Quiz competition we conduct a preliminary round for all the students of St. Pius X College. From this preliminary round we select two students from each department. The Space Quiz 2013 was conducted on 23rd August 2013, Friday. The Ist, IInd and IIIrd prize winners are Dept of Economics, Dept of Microbiology and Dept of Physics respectively. The winners were granted trophies and cash price. We the SPACE family celebrated the teacher’s day on 5th September 2013, to show our respect and love towards our teachers. In this meeting we honoured our principal Dr C K Luckose and our loving teachers of computer science department. We provide them valuable gifts and flowers to show our gratitude. In the Onam celebration conducted by the college union, we the SPACE members actively participated. Computer Science department win the overall championship of the Onam celebration. A memorable and thrilling event by SPACE was an IT Fest named aavega 13. It was conducted on 25, 26 October 2013 for High School and Higher Secondary students of Kasargod district. Around 300 students from deferent areas of Kasargod district participated in this IT Fest. Tagore Public School, Rajapuram was the winners and Dr Ambedkar HSS, Kodoth was the runner up. We the SPACE family celebrated the New Year of 2014 on 1st January 2014. Our chief guest was our beloved Pro-manager Rev Fr Jose Chirapurath. He gave us a thought provoking message in this celebration. We cut cakes and distributed sweets among us to share the happiness of New Year.